A last minute goal from Alex Stoyles saw Kempston Rovers earn an excellent 3-2 win at Potters Bar Town in their Southern League Division One Central clash on Tuesday night. Deep into stoppage time, Stoyles popped up to score as the Walnut Boys went second, level on points with Farnborough. The hosts had taken the lead on 27 minutes through Lamar Simpson, before Danny Watson (34) equalised. Kempston moved 2-1 in front on the stroke of half time as Tom Guiney netted, before Bar looked to have salvaged a point when Eoin Casey levelled on 90 minutes. However, Stoyles then made sure it was Kempston who took the points home in stoppage time. 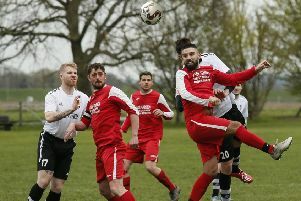 Kempston had also won on Saturday, defeating Egham Town 2-1 at Hillgrounds. The visitors were in front on six minutes when Brendan Matthew headed home, before Kempston went close when Ben Shepherd’s free kick was met on the volley by Watson, ony for the keeper to save and then deny Grant Fryer too. Martin Conway made an excellent stop for the hosts, who trailed 1-0 at the break, before Watson levelled matters on 52 minutes, taking Fryer’s header in his path to score. Just after the hour, Watson put Kempston in front, collecting Conway’s kick forward to round the keeper and score. Kempston: Martin Conway, Tom Guiney, Damon Herbert, Grant Fryer, Alex Stoyles, Seb Simpson, Dom Marsala, Ben Shepherd, Jamaine Ivy, Danny Walton, Ash Fuller. Subs: Josh Winters, Sam Johnson, Sam Macrae. Kempston travel to Northwood this weekend and then visit Bedford Town in the League Challenge Cup on Tuesday night.